Writer Bob Nolan was leader of the Sons Of The Pioneers.The lead singer on the original track is Leonard Slye, later to be better known as Roy Rogers. Their original recording was released on Decca 5047 in the USA, with "Moonlight On The Prairie" on the B-side. 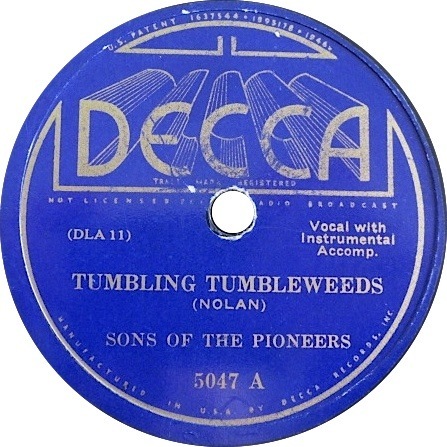 The title used on this original release was the less colloquial "Tumbling Tumbleweeds." It seems that Elvis also recorded the Pioneers' "Cool Water," but this has yet to be found.